Here is a link on how to make fabric yo yos. Paint the fabric yo yos with fabric paint to dress up a simple shirt. It is easier to carefully paint inside the yo yo with a paint brush. If needed dilute the paint with a little water. Cut the cloth into a circle any preferred size. The final product will be about half the diameter of the initial circle. Can keep a round shape object, draw and cut. Fold and sew a running stitch by folding a little or leaving it as is. Folding will give a clean stitch. Keeping the finger in the middle pull the thread slowly and tighten it. And then stitch to the back so it doesn't unravel. I used an elastic pre smocked or shirred cloth. It is sold with the top already shirred like this to make dresses and tube tops. If this is not available, there is an option that I haven't tried which is to use elastic thread in the bobbin and make your own shirred cloth. All we have to do is stitch the sides. To make straps use a piece from the bottom of the dress. Attach the straps to the front of the dress so it can be tied to the back of the neck. Or straps can be stitched to the front and back so it could be tied above the shoulders. Hem the bottom to desired length. A perfect way to recycle and reuse containers that are very useful around the house. We made a place to keep crayons. This activity can be done with any other type of container or tin. Poke a hole then using a sharp scissor with a help of an adult cut the bottle, cut at any point depending on how deep you want the final product to be. Don't use the scissors that are used for cutting cloth. Measure the diameter of the bottle then cut a piece of cloth with 1 1/2" width and use as bias tape or use a store bias tape. Cut the bias tape at least 1/2" more so it would over lap. Use glue and paste the bias tape around the bottle. This is decorative and also prevents cuts when putting the hand into the bottle. Can use liquid paper or chalk ink pens to decorate the outside of the container. These cushion covers will take less than 10 minutes to make. 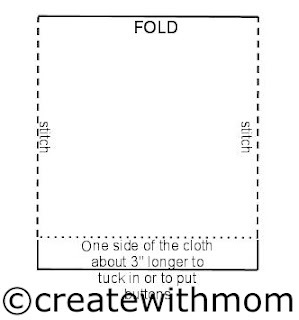 Measure the size of the cushion then fold the cloth according to the diagram below and cut the cloth. I didn't put the exact measurements because the same method can be used for any size cushion or pillow. Measure the cushion then fold the cloth and cut the three sides, when cutting make sure that one of the side is at least 3" longer so this piece can be tucked in and optionally buttons can be stitched. 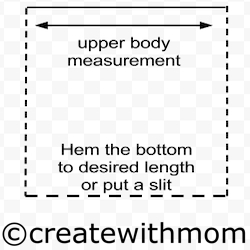 The above diagram will help when cutting and stitching. For this project I used outdoor material from a fabric store and the cushion inside was pre made. The same method can also be used to make cushions and put filling in it, if you want to put filling there is no need to keep that extra length on one of the sides. Instead stitch all the sides.